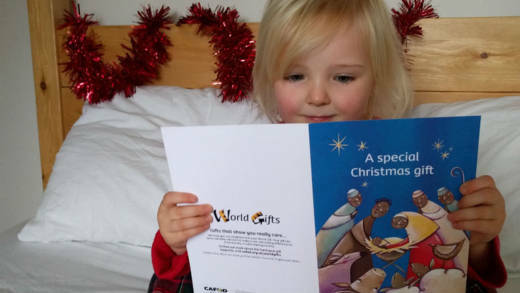 CAFOD World Gifts are an excellent way to support people living in poverty overseas this Christmas. Get your Christmas shopping done early with ethical gifts that save lives! From cards and calendars to gold coins and goats, we've loads of perfect last-minute Christmas presents that help support people living in poverty overseas. World Gifts come in a beautifully illustrated Christmas card. Download, ecard and other card options are available. If you're looking for Christmas gifts with a difference, CAFOD World Gifts make perfect presents! Our range of virtual charity gifts will delight your friends and family, but are also a great way of rediscovering what it really means to share the love, peace and joy of Christmas. Each gift you buy comes with a beautifully illustrated gift card for you to pass onto your loved one, which describes the difference it will make to communities living in developing countries. Place your order online by midnight on Friday 14 December and you'll receive FREE DELIVERY on your gifts and they'll arrive in time for Christmas! You could also choose to go green and send an e-card instead! Make every day of Advent delicious with this Divine Chocolate Advent Calendar. Every door hides a piece of tasty and ethical Fairtrade milk chocolate and a traditional scene from the story of Christmas. Our ever-popular goat gift is sure to raise a smile on someone's face this Christmas. This gift pays for a locally-sourced goat and training in goat care for its new owners. Clean water is vital for drinking, washing and cooking - and something we can't imagine life without! Give this essential gift and provide a family with a supply of clean, safe water. Perfect for sealing your Christmas cards, each sticker represents a meal for someone living in poverty. Explore the CAFOD World Gifts range today. Traidcraft stock some lovely Christmas cards - including religious and modern designs. Check out our World Gifts blog for your step by step guide on How to send Christmas cards that help the world's poorest people. For your Christmas cards themselves, Traidcraft stock a fantastic range and for every pack of cards you buy, CAFOD receives 10% commission. So give a gift, card or festive treat that makes a difference and make someone smile at home and overseas this Christmas. Buy a Christmas gift that makes a difference! Delight your friends and family with World Gifts and help provide Emergency food to a family in urgent need this Advent.